I was delighted when a friend and previous client reached out to me recently to try to catch up and help spread the world about his latest venture. Kash has always been somewhat of an inspiration, moving from his marketing role at P&G in the US (when I knew him) to an exciting and adrenalin filled role leading communications and social media for GoPro that enabled him to travel and live envy-inducing adventures. He has since left all of this behind however in order to fulfil his dream and start the world’s biggest motivational movement: #BeSomebody. The community’s messages of positivity and motivation reach nearly three million people across 30 countries, and Kash was in Dubai as part of the group’s latest project – a six-week global graffiti expedition aiming to ‘tag’ the world. 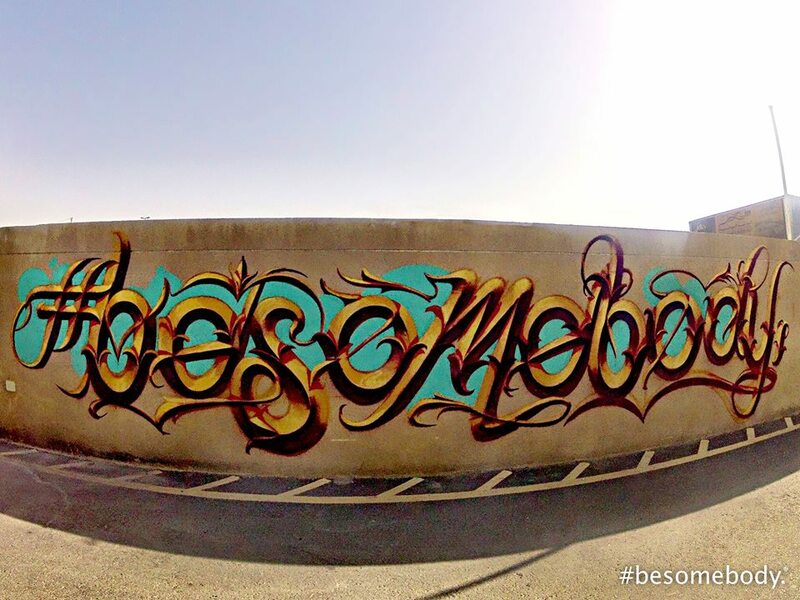 The world tour took in 15 cities in 11 countries across four continents, sharing lasting and expressive sentiments through street art and social media (content was shared across seven different social networks, as well as on the movement’s original website www.besomebodyblog.com). Dubai was the only Middle Eastern city included in the world tour, with the artwork being produced in Alserkal Avenue, Al Barsha, and I’ve included the image of the tag that was produced and can still be seen in the arts district below, images from the other locations around the world can be seen on #Besomebody’s Facebook page. I’m proud to be a part of this community and to have contributed in any small way to the project, and I very much look forward to supporting and sharing the next #BeSomebody initiative, which will hopefully bring such a positive and inspiring person back through Dubai again. I just saw this post while doing some late-night research here in Austin, Texas… thank you so much for the kind words and for sharing the #besomebody message and movement… we want to build the Most Inspirational Platform in the world, and it’s people like you and the countless others we met in Dubai that will make this possible. Hope all going week, keep up the good work!